We know that memory loss can be challenging and frightening for the individual and their loved ones. Connections Memory Support Services provides specific assistance and emotional support for residents and their families. Country Meadows is a leader in providing care with memory loss caused by Alzheimer’s Disease or other forms of dementia. Over the last 20 years, Connections Memory Support Services has provided care for more than 10,000 people with memory loss. This experience has led us to develop and hone a unique approach that focuses on building bonds and caring for the whole person. 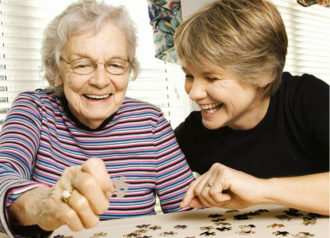 Our Connections Memory Support Services program is offered in our Personal Care and Assisted Living apartments and supervised and secured neighborhoods. Specially trained staff at the following Country Meadows communities care for residents who need memory support: Allentown, Bethlehem, Forks of Easton, Hershey, Lancaster, Frederick, Md., the South Hills of Pittsburgh, Mechanicsburg, Wyomissing, York-South (Leader Heights) and York-West. To learn more about the Connections program, follow the links below or contact our team.